Ironsword is a raw, "leather and chains" underground epic metal band from Portugal. If you are into underground 80's bands like Manilla Road, Omen, and Iron Maiden, Ironsword will likely be worth checking out. Their brand of metal is nothing new or inventive, but this album sound inspired and full of character. 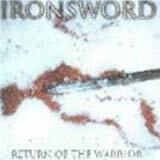 Return of the Warrior is Ironsword's second album, following up their 2002 debut album. Work is already underway for a third album. Without further ado, let's get into some specifics of the album at hand. While there are many "throwback" bands around today, many of them fail to capture the raw energy, enthusiasm, and charisma of their influences despite their sheer musical talent. How many times have you heard new album and thought, "Yeah, that's nice and all, but the songs just don't grab me or inspire me" after the first listen? Such is not the case with Ironsword. Clearly, Ironsword has an old school flavor to their sound, but you also get the intensity and charisma with Ironsword that was so common with albums such as this in the 1980's. Musically speaking, head banging riffs are the main ingredient to Ironsword's sound. Thunderous rhythms and extended guitar solos also flow generously throughout the album. The raw and energetic first two albums of Running Wild come into my mind more than just a couple times while listening to Ironsword, especially with faster tempo songs such as Brothers of the Blade and The Wench. Tann's lead vocals are very powerful, and also very gruff. If you can imagine Piet Sielck singing in a more aggressive, abrasive manner, you'll have a good idea of what the lead vocals sound like on this album. Just like classic Iron Maiden material, or any classic 80's epic metal anthem, Ironsword has a way of infesting your memory with their music. The riffs are heavy yet catchy, and the Maiden-esque rhythms also help to drive the songs home. The drum work is very interesting, with the cymbal work in particular giving the songs a unique personality. You'll also notice that the songs are well balanced, thanks to the solid, authoritative bass playing of Rick Thor. When combined with Maalm's percussion work, these two form a fantastic rhythm section for Ironsword. Lyrically, the band is very much into the often heard fantasy, sword, and warrior type of lyrics. I guess one look at the back cover and seeing titles such as Beginning of the End, Return of the Warrior, Way of the Barbarian, and Dragons of the Sea would lead one to that conclusion. However, make no mistake, this is no happy, ultra high pitch sung power metal album. The music is forceful, and the lead vocalist is intense and aggressive. There just aren't many bands making this type of music today, especially with the passion and intensity that created such a cult following for the genre some 20+ years ago. Return of the Warrior is a collection of twelve solid tracks that any fan of classic 80's epic metal fan will enjoy. No tender, sappy power ballads will be found here. Instead, you are treated to 12 consistent tracks of old school heavy metal bliss from a time where music was played with passion, and raw intensity. As I alluded to earlier, those who insist on something new and original in their music won't likely enjoy this album. If forceful, pure chains and leather heavy metal is your thing, don't miss these guys! Unfortunately, the band's website is currently down. For more information, contact the band here.